I know, I know… It’s been a little while since I said hello. I’ve been so busy. I got a few weeks paid teaching work and I also got a place at Huddersfield Uni. It’s all go! 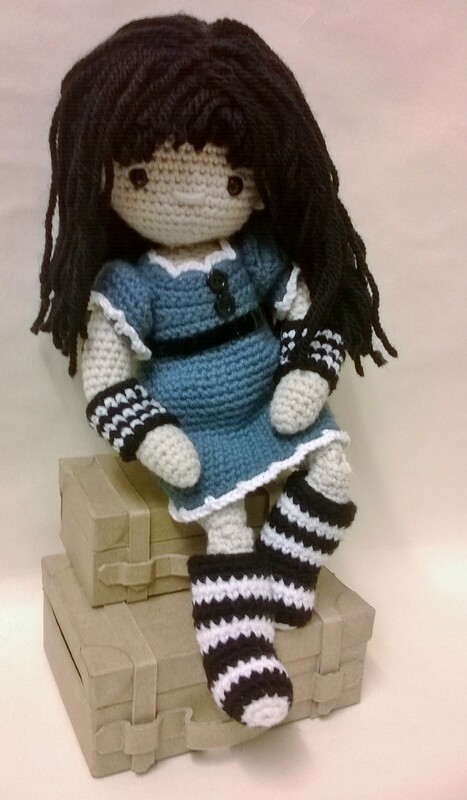 But I finally sat down and finished the next doll pattern for the little crochet doll. 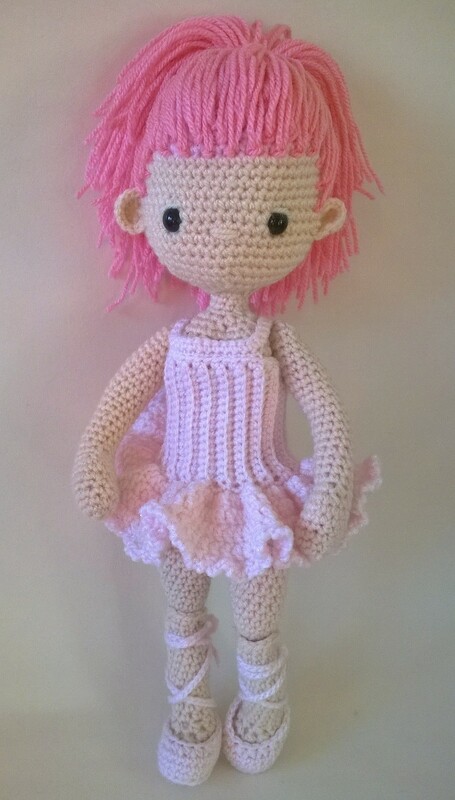 This time a pink ballerina doll. She is fast becomming one of my favorites. The bodice from the tutu came from a similar style of dresses from the by hook by hand blog. The dress is written in full, but you will need to buy the My Little Crochet Doll pattern from my Etsy or Ravelry shop to make the doll, underwear and ballet slippers. I was thinking a Victorian outfit, or maybe a cooks outfit. What do you think? While I’m here I might as well let you all know about the next needle felting session at Inkwell, Potternewton Lane, Chapel Allerton. It’s Saturday 22nd March, 10.30am till 12.30pm £6 each. 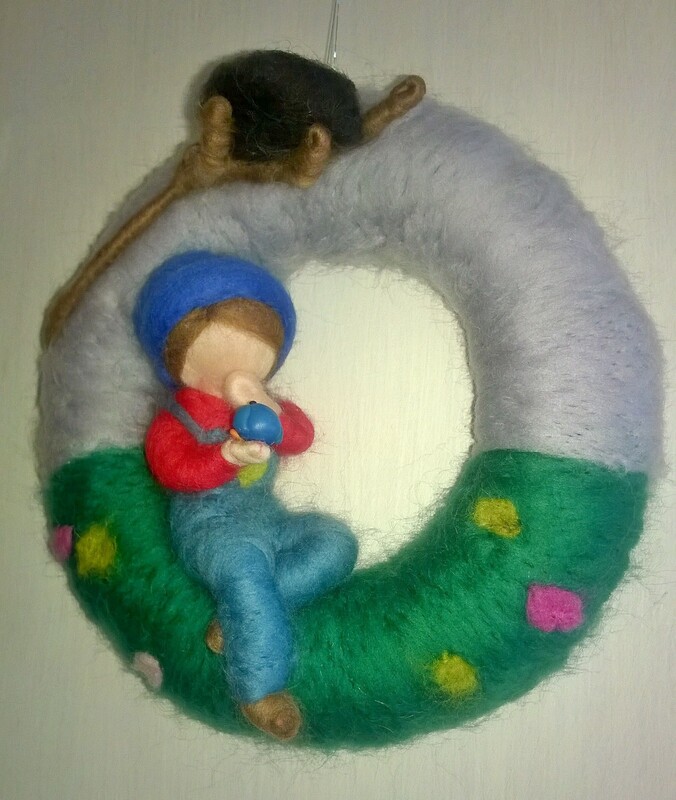 We’re making the needle felted fairies and dolls for Mothers day. We made them just before Christmas and everyone loved them. This time though we can look at free standing dolls. I haven’t taken any photos yet, but here’s a similar mobile I made using the same process, it’ll at least give you an idea. I bumped into someone yesterday who had been looking through my blog and Etsy shop. They wanted one of the Little Crochet dolls but didn’t want to learn to crochet. He asked the question I fear the most, how much? As a doll collector I have no problems paying for the doll I want, within reason. Mary Shortle, my local doll shop allows you to pay bit by bit for the doll you want, so I am able to save without too much fuss. But many people who like my dolls are not collectors and I worry how they’d react when I tell them the cost. I could be the bold artist type, who has no worries putting a £400 price tag on a small painting. But I’m not bold, not that bold anyway. Many people say you should charge £20 an hour for your work plus materials, well, a doll could take me 2 days work. That’s £20 x 16 hours. £320 for a doll. Even I would refuse to pay that and paying myself £10 an hour is £160, a better price but still £10 more than I have ever paid for a doll and that was a porcelain, silkstone Barbie that’s more of an investment than a play doll. The result therefore, is a sheepish seller who feels like I’m risking humiliation by asking for £70. Is that alright? I know it’s a lot, it takes a lot of work though… and the worrying goes on. Why oh why can’t I be bold? Why can’t I say proudly that a doll is £70. It may seem like a lot, but it’s hand made, one-of-a-kind. Just for you. Where else can you buy a doll and choose it’s hair colour and clothing? So, from now on I’m going to give it a go. If you ask me how much a doll would cost I’m going to stand up straight, chin up, hands on hips and in a loud voice say, “My dolls are £70”. So, now I come to another problem. As a member of The Salvation Army, I should be buying Fair Trade where ever possible. I think it’s a great idea, and believe that people who work hard to earn a living should be paid for the work they do. But often Fair Trade means African farmers, Indian cloth makers. I don’t want to take that away from them, not at all. I would like more of it. I too, would like to be paid for the work I do. It seems in the UK at least, we grumble at the thought of paying for handmade items. Back in the days when I had my market stall I would make my Star Wars characters and put a £12 price tag on them. They take around one and a half hours each, so I was looking at £8 an hour. That seemed far too high for most people so I dropped my price to £10, working at £6 (ish) an hour. Still many people grumbled at the price. Towards the end of the stall, when I realised people just wouldn’t pay I dropped the price to £8 (£5 an hour) below the minimum wage. And yet… I had one guy who really wanted one, but when I told him the price he threw it onto the counter, grumbled something unrepeatable at me and stormed off. That wouldn’t be so bad, but at the time there were Star Wars characters made in Hong Kong, in a factory the same size as mine, but less detail and selling for more than I was asking. Not only that, Cath Kidson was at the time selling a small crochet bear, a very simple plain pattern, for £8 and people seem to flock to buy them. They’re not made by Cath Kidson, she might have come up with the idea, but I doubt she has even put her hands on the ones your about t0 hand cash over for, so you’re paying just for a label. It seems Fair Trade only works when it involves other countries, or when the maker/artist has the cash or support to get a name. I don’t begrudge them, people should pay for quality. But far too often people think handmade things should be cheap while happily paying over the odds for often poorly over manufactured items made quickly in factories by machines, not humans. Head heald high, hands on hips, looking you straight in the eye with no guilt. Dolls are £70. Now that’s said, quietly lowering my head, cap in hand, whispering sheepishly, which means I’m working for £4.30 an hour, if that’s ok? Tomorrow, 10.30am – 12.30pm at Inkwell, Chapel Allerton, £6 each. 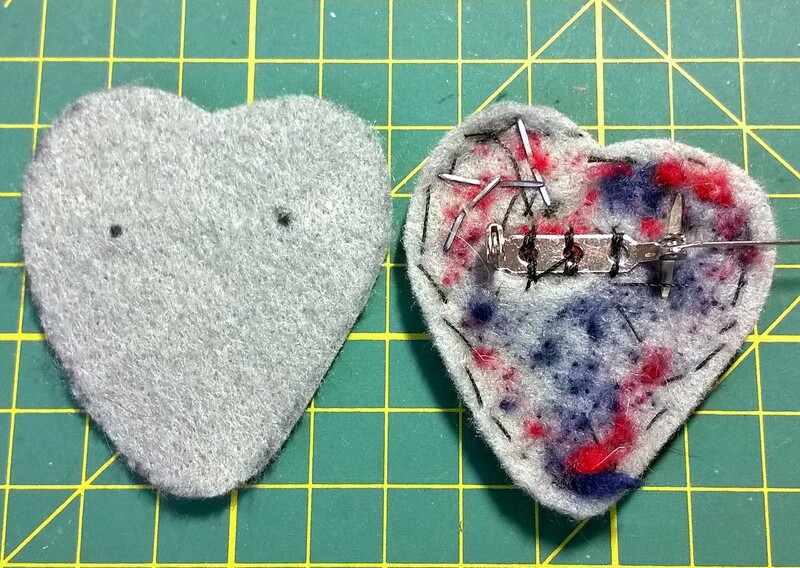 We’re making Zipper heart brooches ready for Valentines day next week (yep, it really is that soon). 1. 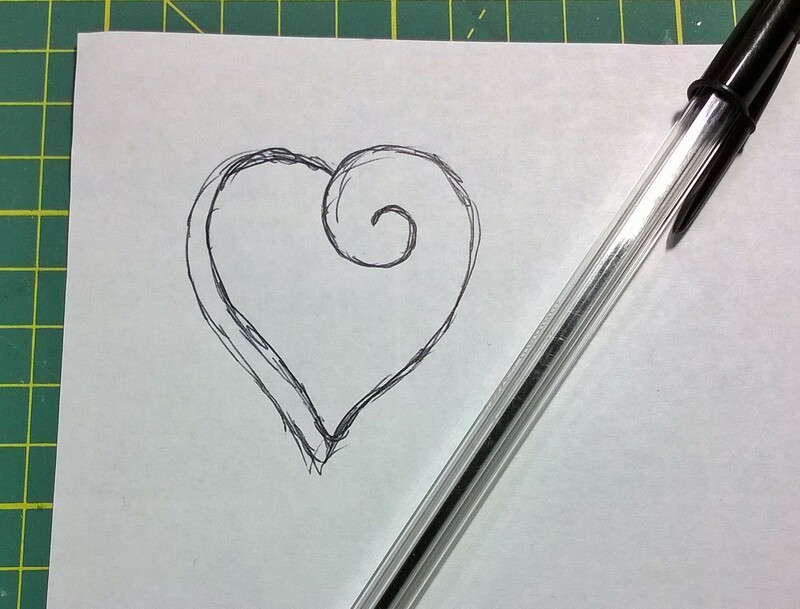 Draw your simple design onto paper..
3. 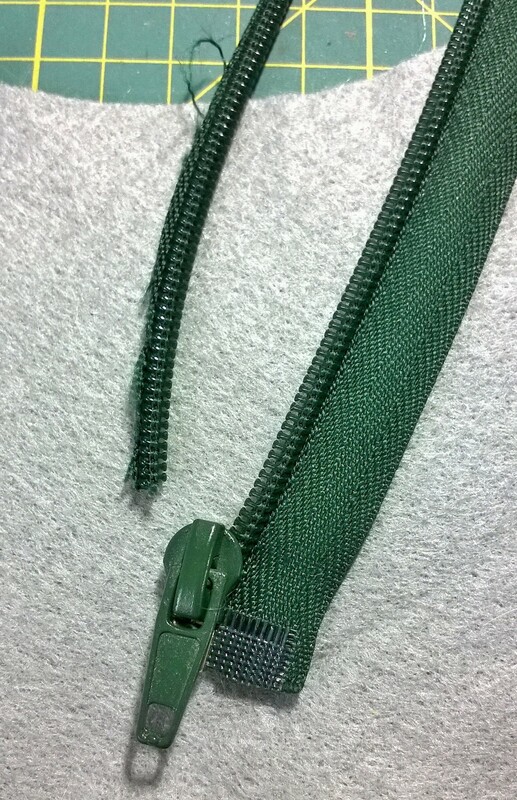 Take your zip and trim off the fabric edge, leavng the metal or plastic teeth. 4. Whip stitch the zip into place, making sure the thread fits tightly between the teeth. 5. pick out the paper centre, use a needle to get into tight areas. 6. 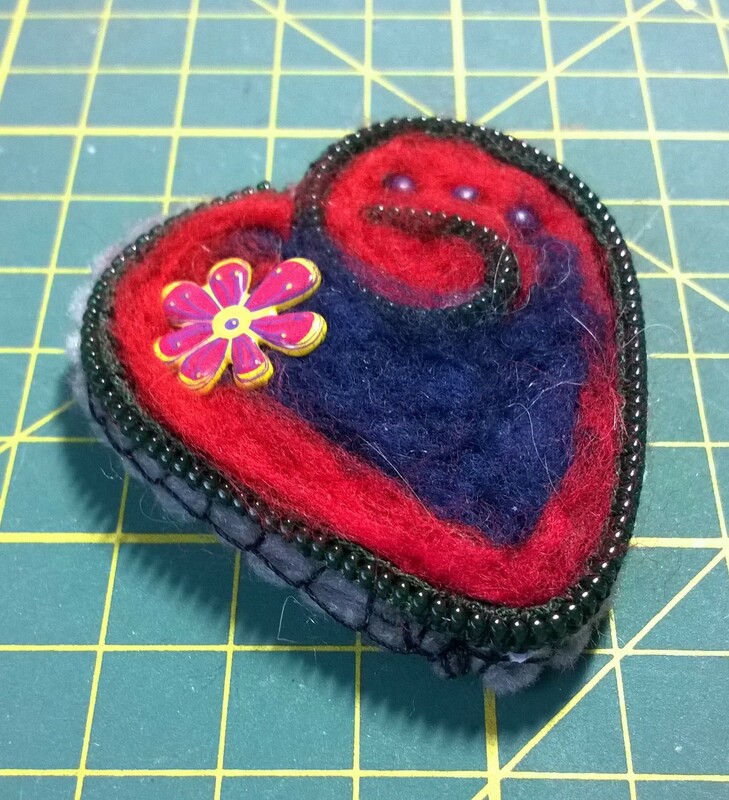 Needle felt small bits of felt to the centre of the brooch. 7. 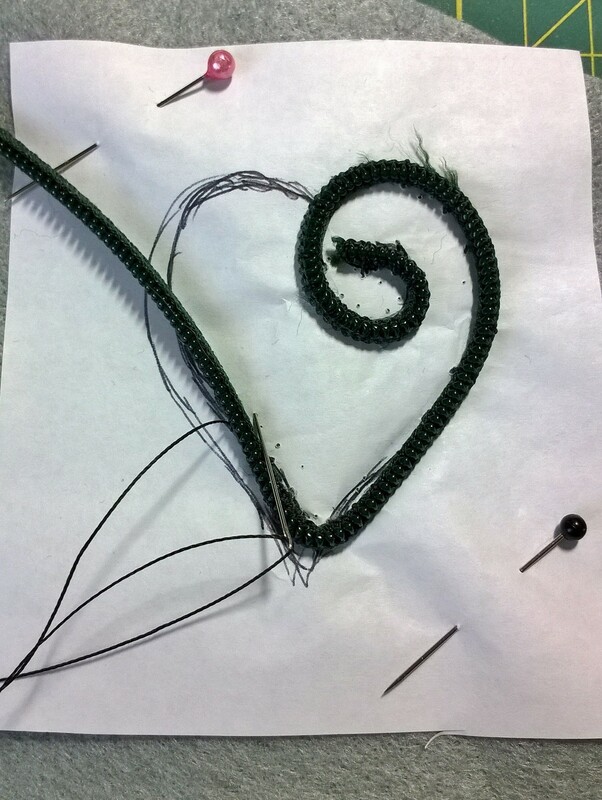 Keep going until the brooch is filled. 9. 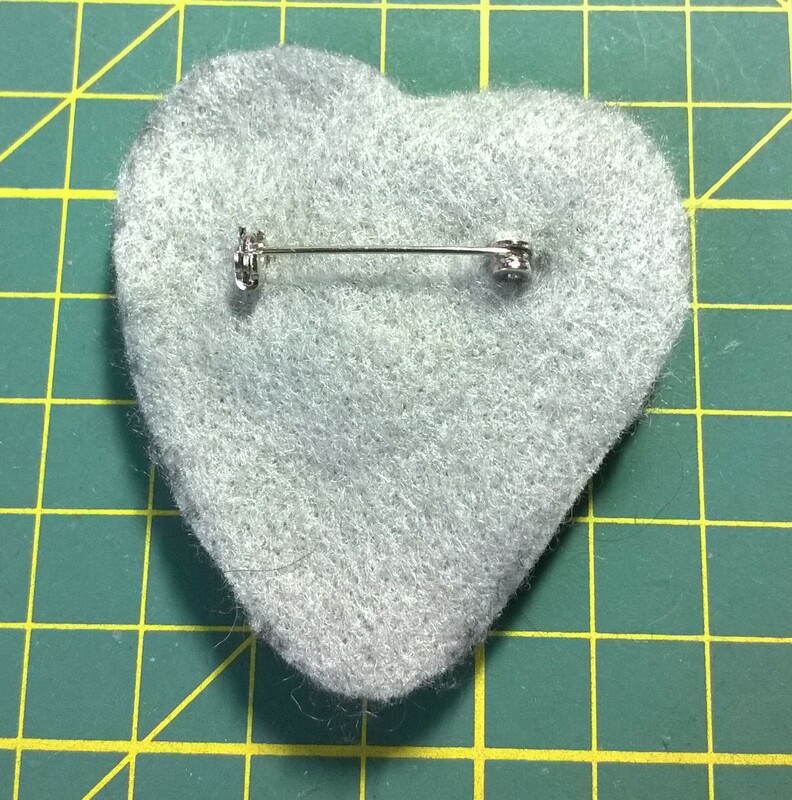 Turn the brooch over and sew the brooch pin onto the felt. 10. 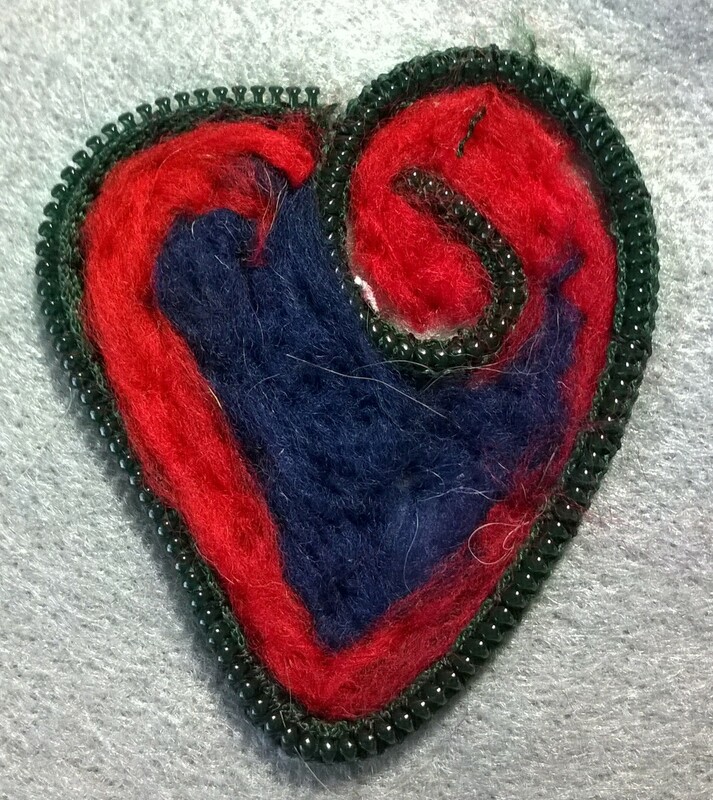 Cut out the brooch and draw around it onto another piece of felt. Cut this second felt piece out. 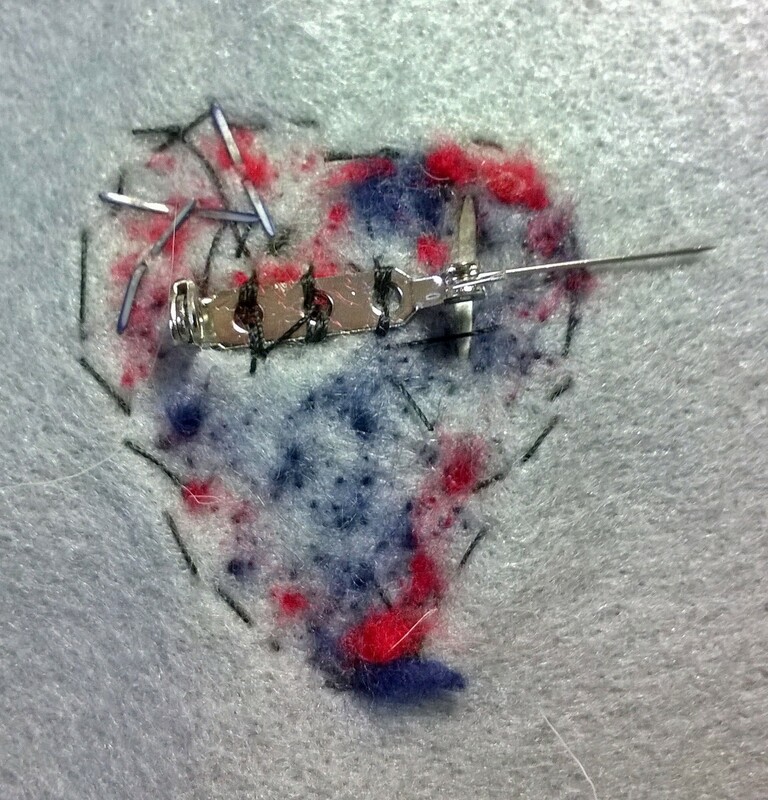 11. place the second piece over the first and mark the two pin ends of the brooch. 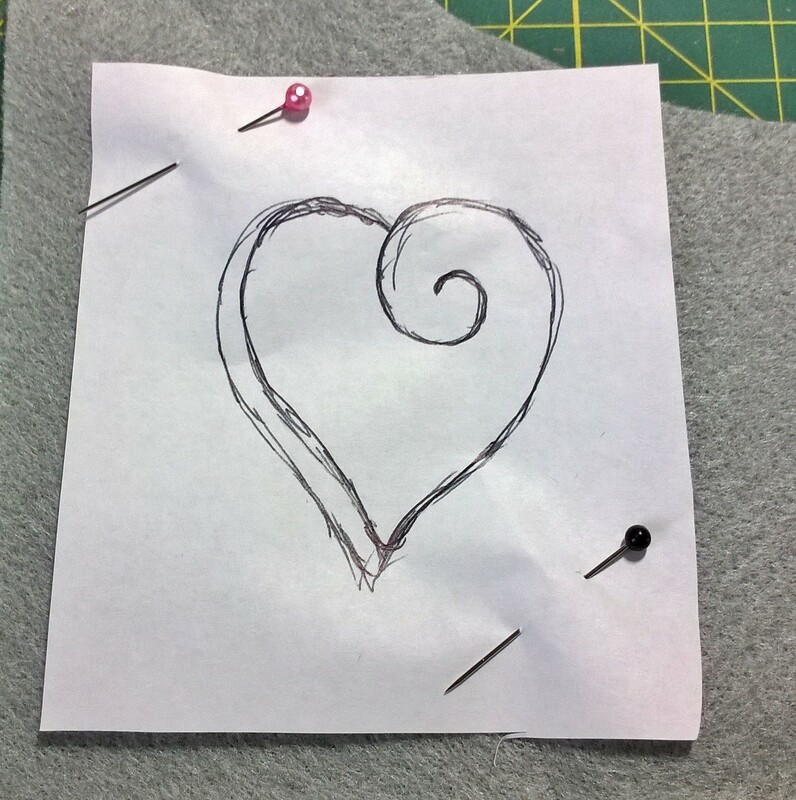 Make a small cut where you have marked and place the second piece over the first, pulling through the pin ends. 12. 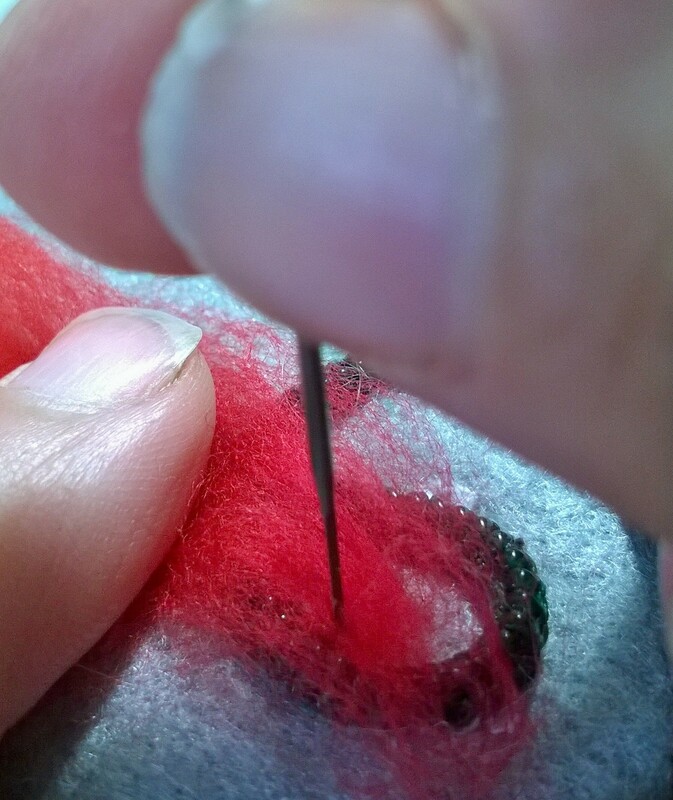 Blanket stitch around the edge, making sure you stitch through both front and back felt pieces. 13. Pin the brooch on and enjoy! There are many designs on the internet, have a google around, some are simple, others very intricate. 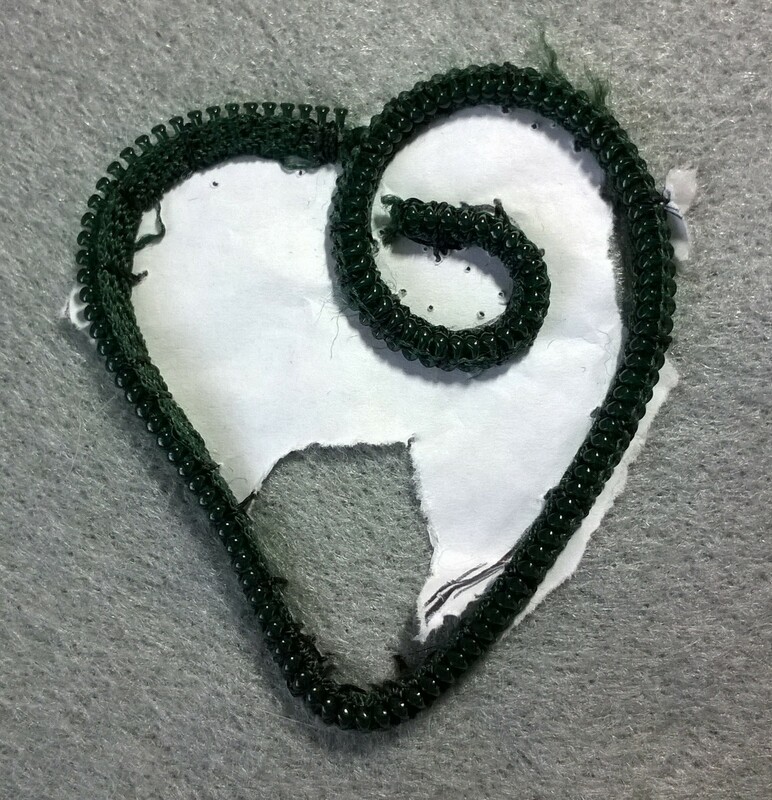 There are also other ways of making the brooch, mostly by using a glue gun, but the thought of young people loose with glue guns scared me a bit (plus I only have one) so I came up with a way of making the brooch without hot glue dripping from little hands! Saturday 22nd February, 10.30am, Inkwell, £6 Spinning. No, not spinning on a bike (that’d be very interesting to see) we’re going to make our own little drop spindle and do a bit of spindle spinning, making our own wool. We only have two hours, and already it sounds like it’ll be popular. I’m either mad or developing some great marketing ploy, but something I listed on Etsy I’m giving away on my blog for free. I wrote this little pattern some time ago and started selling kits so you could make your own little doggie at home. I recently updated the pattern, included needles and bead eyes in the kit and am selling the whole kit on Etsy for £5 (or £10 for three) The kit makes a lovely little gift for crafty dog-lovng friends, so buy them if you can. The three kit colours are for a Black Scottie dog, White highland Terrier and Brown Yorkshire Terrier. Am I mad? Who knows. 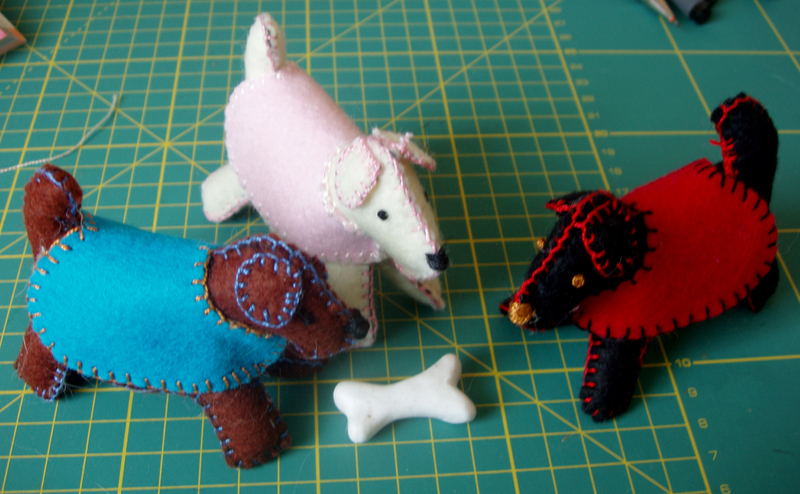 We made these little doggies two Saturdays ago at our little craft class in Leeds and they went down a treat. The bone is Polymer clay, I also made a polymer clay dog bowl, but that’s gone walk-a-bout. Well, buy the kit, or print the pattern and buy the materials yourself. As with all my patterns, you can make to sell, but don’t sell the patterns, I’ve got to make some money somewhere and keeping my cat in the luxury she is used to isn’t cheap! 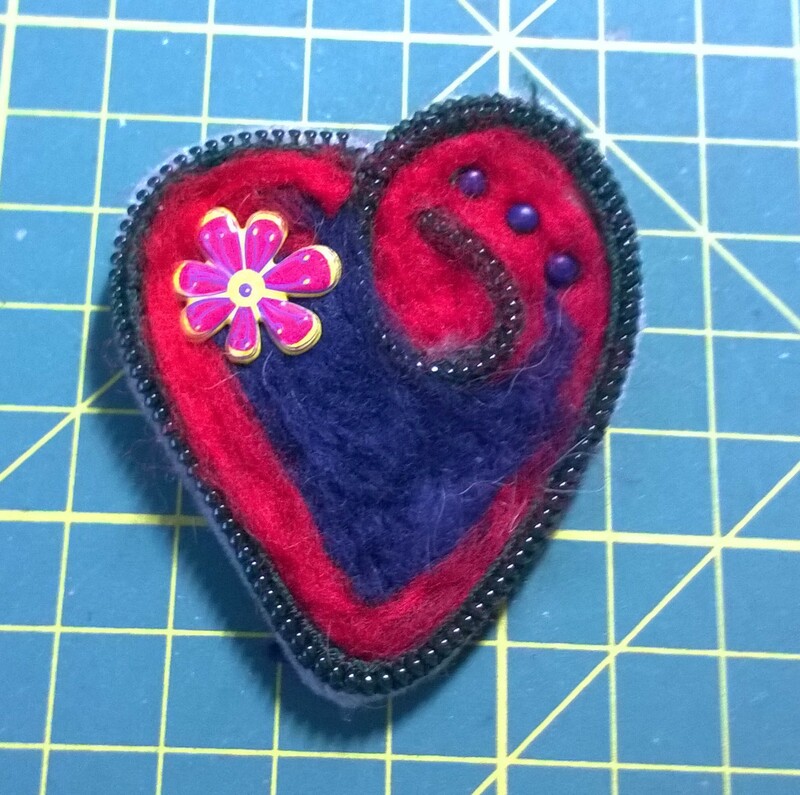 Here’s one I made earlier, made out of a bits of felt and an old zip, a great way to use up odd bits of felt. I was planning to have instructions on the blog before Saturday, but I’ve a busy busy week and might not have time. £6 per person and a lot of fun. 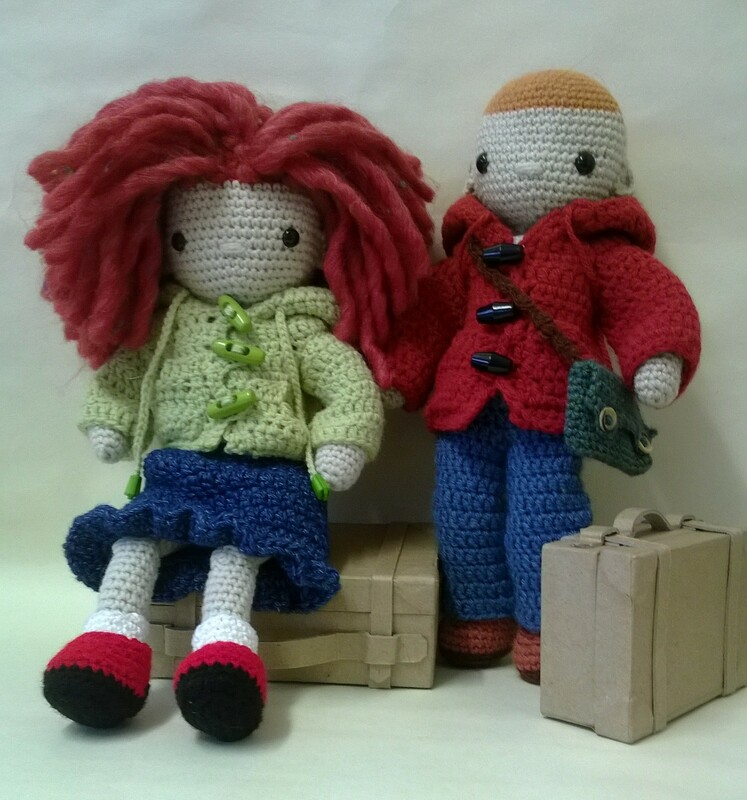 The next free pattern for the Little Cochet Dolls. 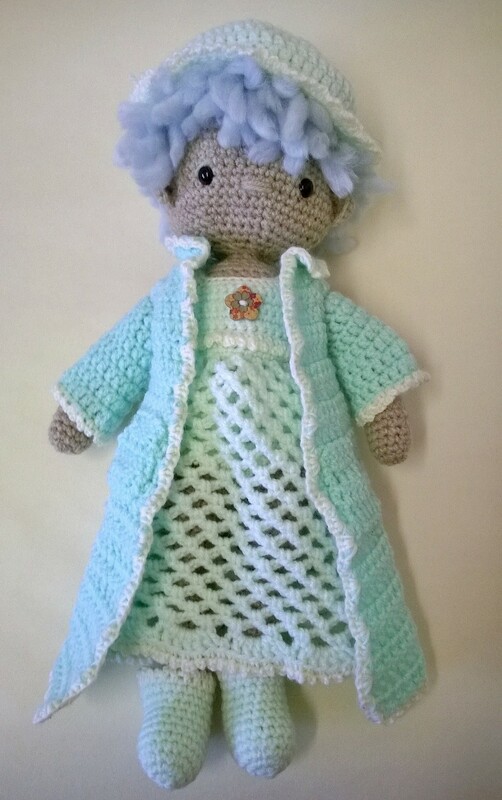 The Pattern includes full instructions for the Nightgown, Dressing gown and Night cap. It also tells you how to make the frill on the bedsocks and underwear, although you will need the original Doll pattern for the doll, socks and underwear. 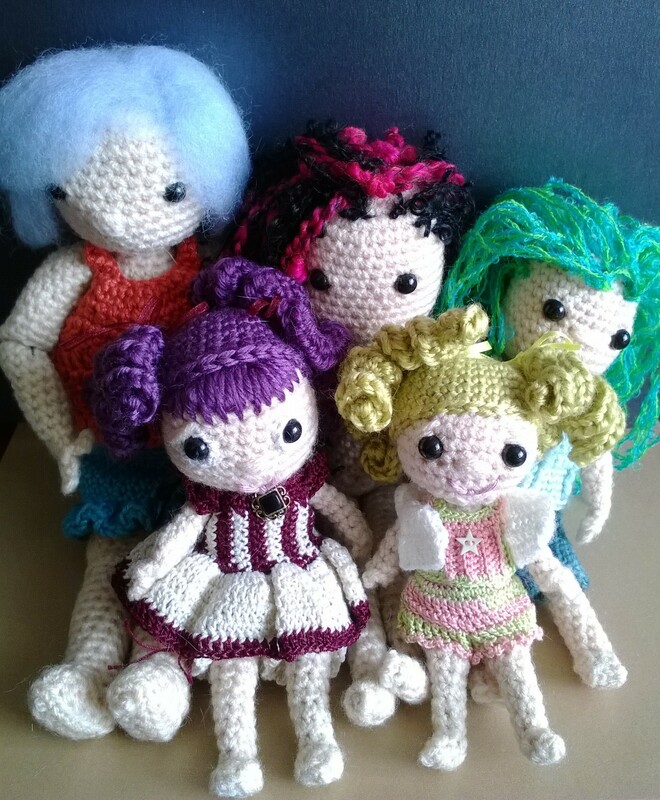 The pattern is selling on Ravelry and etsy, jusy google betty virago or my little crochet doll on either of those sites and you’ll find it. Am working on a Ballerina outfit next. Then I’ve thought of a Victorian outfit and have a few other ideas, but am happy to have ideas. 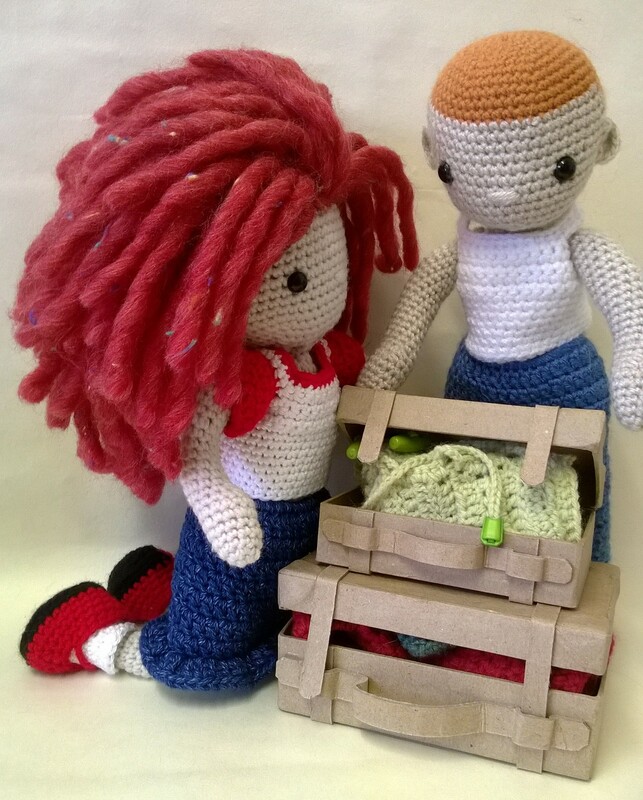 The Joanna project in Leeds is a charity that is very close to my heart, so when they asked me to make a doll for them to make money with I was right on it. 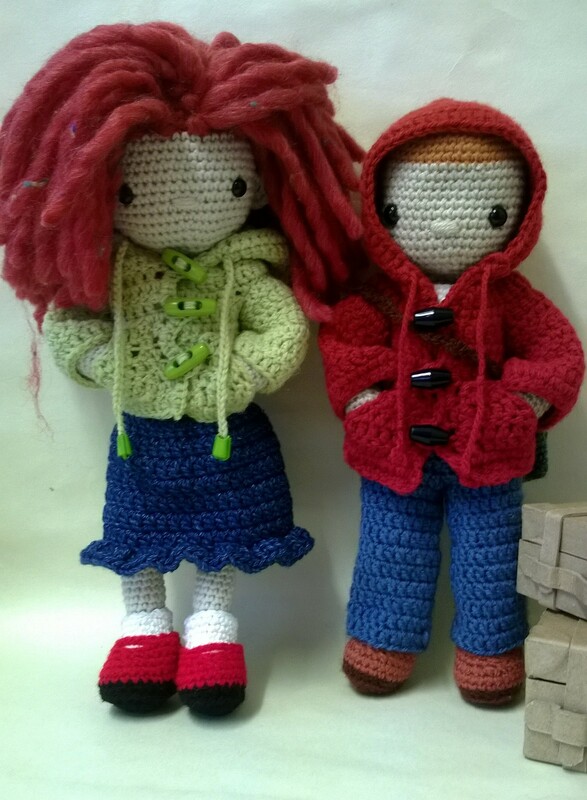 This is the doll I made for them, they haven’t even seen it themselves, so this really is a sneak preview. She has another outfit currently being made. So, as of yet, I’ve no idea how they will raffle, auction or sell the doll. I’ll let you know as soon as I do. Otherwise contact them and get your name down for information. 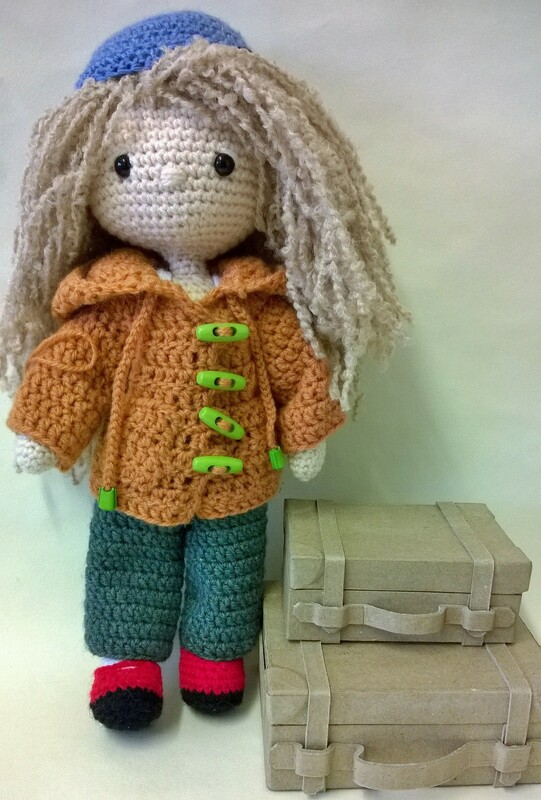 She is a FREE pattern, but… You’ll need to buy the My First Crochet Doll pattern to make her. She has underwear (as all dolls should have! ), a dress, coat, hat, wristwarmers, socks and boots. 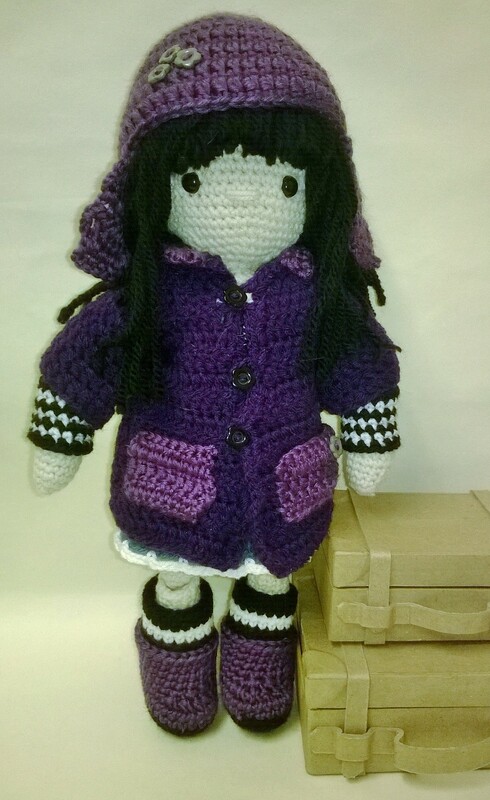 You can download the pattern here…MFCDGorjuss and buy the doll pattern needed from my ETSY shop or on Ravelry. I’ve been busy cleaning my place, it was getting a bit unorganised. Give it another few days and I’ll be making more things. Have a bedtime doll planned next I think. I’ve been working on a new pattern, my best so far I think. 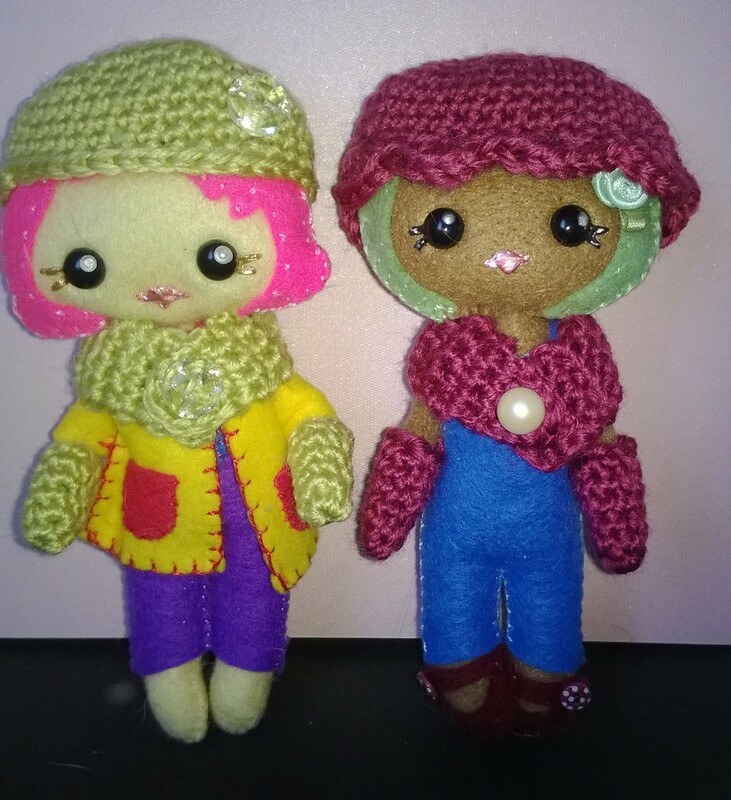 Ellie and Sam, two little crochet dolls, with poseable arms and jointed knees, two body styles, and a lot of possibilities. …shoes, trousers and a skirt. The patterns can be adjusted so the vest can be changed to a sports bra or a t-shirt, the jeans can become shorts. 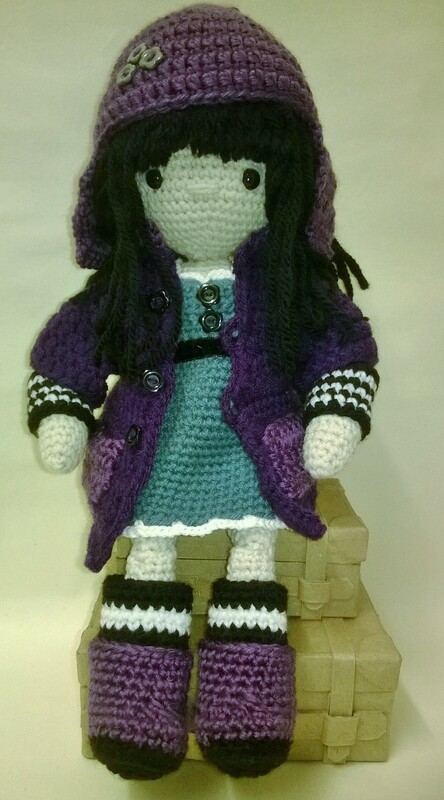 Plus details like the duffle coat having a hood that actually fits and pockets that the dolls can use. 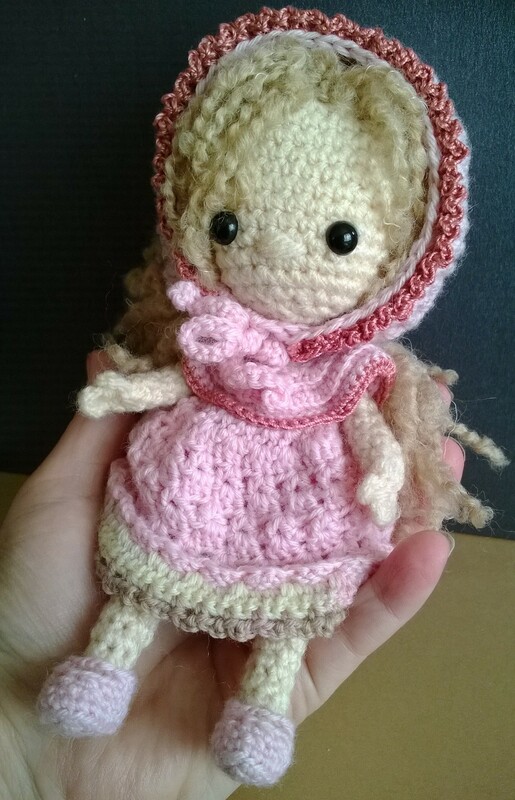 I’ve made the doll so she will grow with the child, the hair is patterned into the head for young children, you can add long hair as the child grows. There are two bodies, one straight and the other with a bit of a waist and curves, and a simple waldorf style face that lets imagination grow. Email me, bettyvirago@gmail.com, with Free pattern please in the subject title and I’ll do a draw the moment the pattern is ready to be posted on Ravelry. You could be the first to get the pattern. Winter is here… Bah Humbug. I don’t like cold or snow and the wind today was awful. But… the pepperpot girls love wrapping up warm for winter. So here’s a little something to keep your doll warm. It’s a little crocheted hat scarf and glove pattern, hope you enjoy it. I used a 3.5mm hook and oddments of DK yarn. The hat and gloves are worked in a continuous round begining with an adjustable ring. There are two finished for the hat, one with frills and one without. The scarf is quick and simple and needs one little button to finish it off. 1) Using an adjustable ring make 6sc in the ring and pull to close. 11) (5dc in next sc, sk 1, sc, sk 1) around, join with a slip stitch and FO. Leave a long thread to sew the button on the scarf at the end. Slst in next sc and FO. So, how’s the dolls going? If you’ve made any pepperpot dolls and want to show them off I’d love to see them. If you haven’t yet made any the pattern is in my Etsy shop, buy now because I’m putting the price back up soon!!! 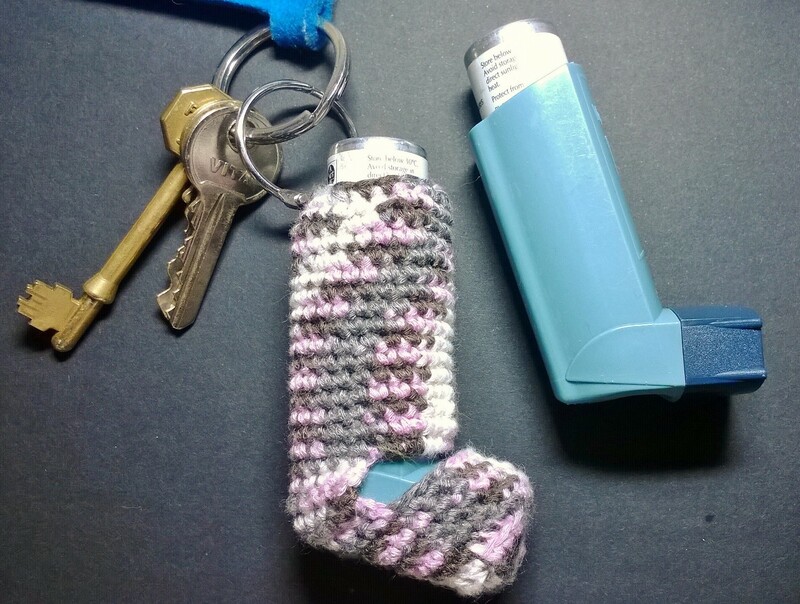 If you’ve ever been in that situation where you’re rooting in your bag for your inhaler, or forget to take it with you, then this pattern is for you. The inhalercover fits snuggly over your inhaler and attaches to your keysor bag. It’s best to use a cotton or bamboo yarn because they don’t fluff, breathing in fluff while using an inhaler sort of defeats the object! I used Sirdar Baby Bamboo yarn and a 3mm hook, I also wrote the pattern in US terms but since its mostly single crochet (double crochet in UK) it shouldn’t be a problem. Working in a continuous round, Chain 4. 17) being careful not to twist the chain, join chain with a sc to first sc of row 16. You are now working in rounds again. 33) sc around to the back of the cover, ch4, sc in the next sc (this creates a loop to hang a clip or key ring) slst in next sc, FO. Just a little pattern I thought I’d share with you all.